To be totally honest, this last week was exhausting as I came down from the high of spending a long weekend in Vegas (which you might remember me mentioning here). The exhaustion was totally worth it, though, because what could be more fun than celebrating the last of your best friend's "singledom" in Las Vegas, NV with a great group of girls? 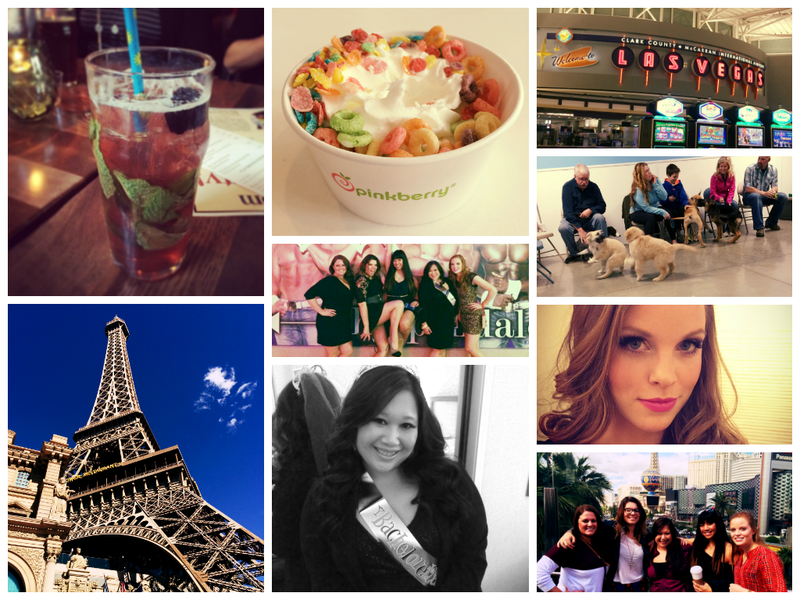 You can see snippets of our stay sprinkled in the collage above - a snapshot of the Las Vegas airport, the amazing Paris hotel with a massive recreation of the Eiffel Tower, an evening on the town to see Chippendales, walking the Strip to see the sights, a quick stop at Pinkberry, and the gorgeous bachelorette beaming from ear to ear. From Monday on, however, I was a tired thang as I tried to catch up on missed sleep and relaxation. But the show must go on, and the week had some other fun things in store for me - a new product launch at work celebrated with a happy hour cocktail, Winnie's second puppy class where she learned the "Come" command and has started to pick it up quickly, a final dress fitting for my bachelorette bestie, and a relaxing dinner with my parents, husband and Winnie to cap off the week (not pictured). I hope you had a great week, too! Cheers to a bit of weekend R&R and we'll see you back here on Monday!